*A hint to non-twitterers, read from the bottom to the top. Little rotten girl! 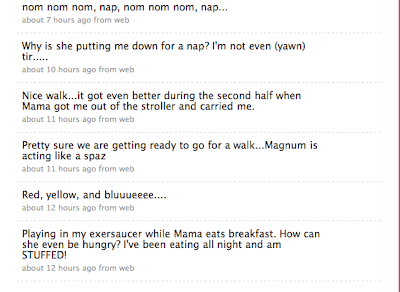 Tweetin' all over the place. And, a side note, there are a few videos of Olivia up on Vimeo. You can find the link to the right of the new post. Please turn your volume WAY down. What a cool post. How ingenious of you. Olivia sure looks like she knows what she is doing. This is hilllllarious! 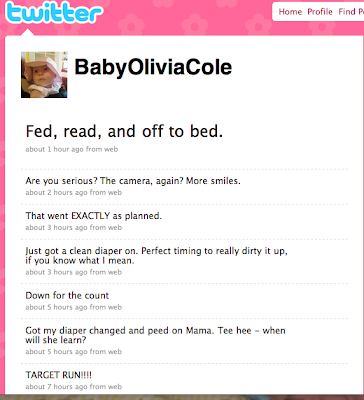 I need to make make Olivia Cole one of my Tweeps asap! Ha ha - Notice I didn't let her use my Mac? I didn't want drool all over it!